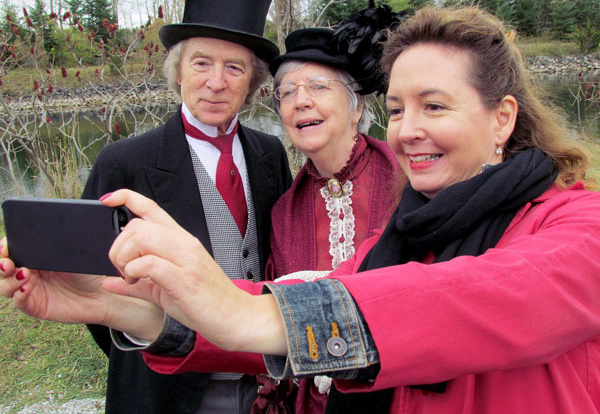 On May 9th, 2015, Sir John A. Macdonald and Lady Agnes will dine in Belleville at the Quinte Friends of Sir John A. Macdonald dinner. Sir John and Lady Agnes will travel through time to join their Quinte Friends for an evening of fun, mixing reminiscences about historic times they’ve spent in the Quinte region with their take on modern times and current events. The Historic Murray Canal District is sponsoring the event. Funds raised will help defray costs for HMCD’s Quinte Heritage Festival on August 22 and 23, 2015 and our previous Murray Canal 125th Anniversary Celebration held last October. The past greets the future as Sir John and Lady Agnes pose for a selfie. The dinner is in the Park Room at the Belleville Travelodge overlooking the Bay of Quinte. The evening promises to be fun and informative with cocktails starting at 6 PM, followed by the dinner program commencing at 7 PM. Tickets for the evening are $100 per person and can be obtained by contacting HMCD at info@murraycanaldistrict.ca or calling 613-475-3304. The Historic Murray Canal District (HMCD) is a non-profit group focused on improving quality of life in the area of the Murray Canal and thereby in the three municipalities that intersect in the Murray Canal District.